तेरी याद में आँसू बहते हैं, इतना न मुझे तडपाया करो.. !! जय जय श्री मदन मोहन जी !! Sneha Adolkar, Rohan Shanti Shukla, Amit Goswami and 19 others like this. Now a days Shri Madan Mohan ji With Shri Radha Ji and Shri Lalita Sakhi Ji resides in Karauli (Rajasthan). Due to the Muslim ( in Aurangjeb time) invasion at Vrindavan and Mathura most of the Deities ( Shri Govindadev Ji, Shri Radha Damodar Ji, Shri Radha Gopinath Ji, Shri Madan Mohan Ji) worshiped by the Goswamis were moved to Rajasthan – Jaipur by the King of Jaipur......Those Deities are still there nowadays. 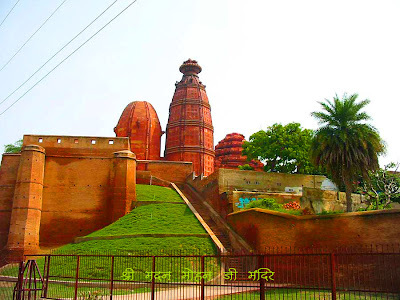 At Shri Dham Vrindavanwe can see nowadays Partibhu vigraha of all Those Deities. But They are considered not different frothe original.....Actually, Shri Krishna never leaves Vrindavan..... Therefore also the Deity never leaves. This is the mood in Vrindavan…. Sri Madana Mohana Ji is presently worshiped at Karauli, Rajasthan..... When the daughter of the king of Jaipur was offered in marriage to the king of Karauli, she very insistently requested that her father send Lord Madana Mohana with her as a dowry, as she was very attached to Him...... Her father was very reluctant and agreed only after stipulating one condition: " Shri Madan Mohan would be placed in room with many other Deities..... Whoever she chose whil blindfolded could go with her to Karauli." !! Jai Jai Shri Madan Mohan Ji !! Aapne dhanya kar diya. Jai jai shree Radhey ! 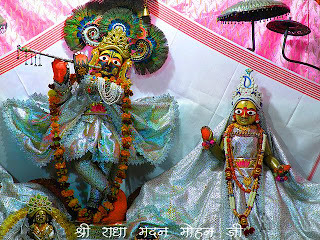 jai shree madan mohan ji.....madan gopal sharan teri aayo...radhe radhe. Madan Mohanji also told her in dream that I will break my flute so you find the Thakurji with the broken flute. So you see in the picture only half the flute as he moved his hands and you can't put it all the way through! Or sometimes they put half in one side and half in the other. Before I knew this I thought it was just an optical illusion that you cannot follow the flute straight with your eyes! cheen liyo mero bhoro so mann..madan mohan payro madan mohan...madan mohan shri vrindavan chandr...khudaoo ke khuda sarkar shri madan mohan lal ki jai ho sadev..